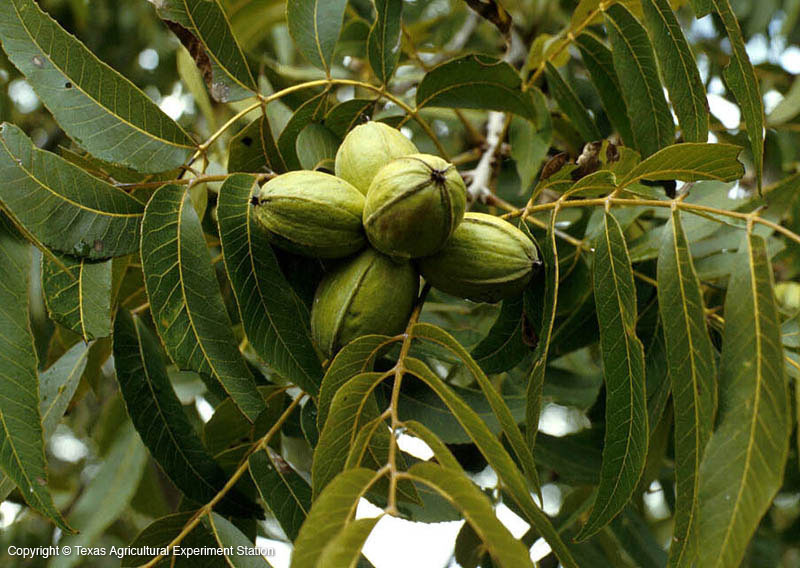 Pecans are large deciduous shade trees tolerant of conditions in all of Texas. Supplemental water is needed in the Trans-Pecos area. They are healthiest in rich deep bottomland soils, but will adapt to lesser sites. They are the fastest-growing of all the hickories, but like the others of the genus they are difficult to transplant because of their large taproot. While the foliage is fairly fine textured, the tree drops fruit (source of edible pecans), twigs, leaves, and sometimes branches, making it a less than perfect landscape plant. Pecan is the state tree of Texas. Fruit Characteristics: edible nut enclosed in a thick leathery four-valved husk. Additional Comments: Tends to develop Zn deficiency on alkaline soils, which can be corrected with applications of chelated Zn or foliar sprays; best reserved for use on large sites.